The World Health Organisation (WHO) estimates that each year approximately one million people die from suicide. It represents a global mortality rate of 16 people per 100,000 or one death every 40 seconds. But the more worrisome factor is that the rate of suicide is increasing every year. For example, in the last four and half decades, suicide rates have increased by 60% worldwide. It has now become one of the three leading causes of death among those aged 15-44. As a corollary factor, WHO found out that suicide attempts were up to 20 times more frequent than completed suicides. The suicide mortality rate in Sri Lanka was 16.6 per 100,000 population in 2016. The regional rate for the same period was 13.2. Sri Lanka Police Annual Report released recently revealed that a total of 3,263 suicide cases had been reported to Police in 2017. Compared with 2016 figures, this was an increase by 238 cases. We mustn’t forget that for each person who died, there may have been more than 20 others attempting suicide and/or considering suicide. These attempts range in intent and medical severity from the mildly self-injurious to the determinedly lethal. At a personal level, all suicide attempts, regardless of the extent of medical severity, are indications of severe emotional distress, depression and/or mental illness. Police statistics also reveal that age groups from 26 to 30 years and over 70 years topped the list. In gender-wise, 46.6 percent of those who committed suicide were males while 12.8 percent were females. Sri Lanka has experienced major changes in its suicide rates since Independence. According to the statistics of Registrar General's office, at the time of independence (1948), suicide rate in Sri Lanka was 9 per 100,000 people. In the 1970s, it rose up to 19 per 100,000, and in the mid-1980s, it reached 33 per 100,000. Subsequent reductions in our suicide rates have been attributed mainly to the introduction of restrictions on the availability of highly toxic pesticides and a number of other measures. However, the current figure is still alarming when compared other countries in the region. We are losing far too many with every suicide profoundly hurting those left behind. It is clear then, that we still have a crisis of suicidal behaviour among its youths and old-aged people. We need some good research to find out why certain age groups have been susceptible to this disastrous activity. When we study about the Asian countries where rates of death by suicide have been lowered, we realise that assertive and sustained government actions have played a critical role. It means that the government, too, has an important role to play along with other public representative bodies to reach the desired goal. Same studies suggest that a range of social, personality, childhood and related factors indirectly contribute to the risks of suicidal behaviour. The largest contributory factor comes from mental health problems. It’s revealed, 90% of suicides are associated with mental disorders. The depressions act as the main group of mental disorders. A depression (whether mild or severe) can happen due to a great number of reasons like childhood sexual and physical abuse, poor parenting etc. Other groups at risk are persons with severe somatic illness, the socially disadvantaged and those with a recent loss of a loved one or negative life events in the past. Substance users are positioned as a special group at high-risk. 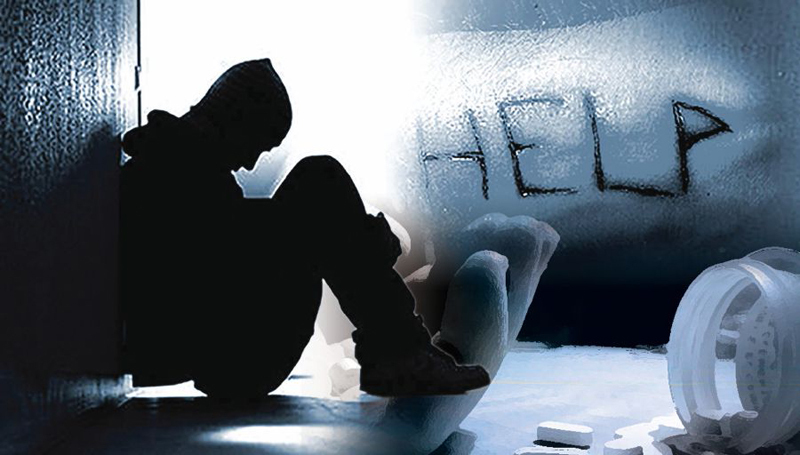 Although suicidal tendency may hit persons regardless of the socio-economic status, statistics reveal that people with low socio-economic status including the unemployed commit more suicides. By acknowledging that the multiple causes of suicide are not amendable by the healthcare sector alone, many countries have developed comprehensive approaches across multi-sectors at all levels (individual, family, community, region and nation). Solidly-structured national suicide prevention programme at national level is one of them. In many countries such programmes are associated with documented reductions of suicide rates. Such a programme will require a tripartite approach that integrates individuals, community organisations, and all related government sectors. Its mission should be to identify and minimise the circumstances that encourage suicidal behaviours. It is unlikely that significant reductions in suicide rates will be achieved without corresponding reductions in the circumstances that galvanise the suicidal behaviours. The programme will require adequate, sustained government and community support and resources so that they could use scientifically developed and well-evaluated programmes. Whatever term we identify it, such a programme needs to include (a) improved recognition and treatment of depression, (b) restriction of suicide means, (c) restrict glamourizing of media-coverage of suicides, (d) improved access to mental healthcare, and (e) healthcare staff capacity building. The following broad suggestions may be worth considering. 1) The elevated rate of suicidal behaviour among the youth should be researched first to find out what factors have attributed to it. 2) The level of ‘Suicide alertness and intervention’ skills among the entire adult population needs to be raised so that people in distress (e.g. a family member or friend) can be identified and encouraged to seek help. 3) More training needs to be provided to the interested community members on elementary counselling methods. 4) Government and local bodies must attempt harder to identify and address those underlying social determinants of elevated rates of suicidal behaviour. They may include, early school dropouts, overcrowded housing, sexual abused children, unemployed youth and youth involved in violence etc. 5) Early childhood development programmes (e.g. home visitation programmes for young mothers, programmes that help children learn how to better regulate their emotions, etc.) will have a positive impact. A culturally appropriate approach to improving the lives of young parents could help prevent many kinds of problems from occurring later in life. Any programme to be successful requires careful thought relating to achieving a balance between the role of the community in suicide prevention, and the development of effective professional services. Communities play a critical role in reducing suicide level. They can provide social support to vulnerable individuals and engage in follow-up care, fight stigma and support those bereaved by suicide. They can help give individuals a sense of belonging and a feeling of connectedness by being part of a community. Lastly, communities can also implement specific suicide reduction strategies assigned to them. Government has a responsibility in facilitating community engagement in suicide prevention. Whereas government needs to take the lead and develop and implement comprehensive multi-sectoral suicide prevention strategies, communities can incorporate and enhance these efforts with their local community needs, priorities and circumstances. It’s a fine workable combination. WHO has worked collaboratively with the Mental Health Commission of Canada to adapt a “tool-kit” type of a participatory approach for global use. The toolkit is a step-by-step guide for communities to engage in suicide prevention activities and have ownership of the process and keep efforts sustained. It is not a manual for initiating specific interventions but describes an active and participatory bottom-up process by which communities identify, prioritize and implement activities that are important and appropriate to their local context. The Government can seriously consider using a similar toolkit as a starting point.